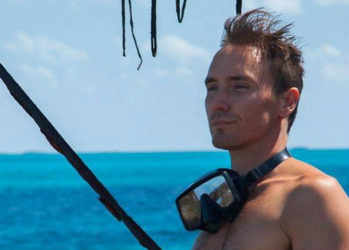 Rob Stewart, the documentarian behind the acclaimed conservation film Sharkwater, and a celebrity in the marine and conservation community was found dead at the age of 37 after going missing during a deep sea scuba dive on Tuesday. A deadly casualty is always a dreadful and moving event, especially for the relatives and friends of the victim. But for people that love to explore the world underwater, there is also the question where and how it could happen. Since I did not know Rob Stewart personally, I tried to focus in this blog mainly on this last question. Stuart was a Canadian marine biologist best known for his efforts to ban shark finning worldwide. On 31 January Stuart and a dive instructor called Peter Sotis chartered a dive boat through a dive shop in Key Largo. Sotis is the owner of the diveshop Add Helium in Ft. Lauderdale who was said to have certified Stewart in a rebreather tri-mix course earlier in Januari. Stewart and Sotis were heading for the Queen of Nassau wreck. Location: six nautical miles off the Florida Keys, 3 miles off Alligator Light, 5 miles off Islamorada in search of the elusive sawfish (Pristis pectinata). The sawfish is an endangered species that resembles a shark in appearance, but actually is large, bottom-dwelling ray. Its name refers to its long, saw-like bill full of razor-sharp teeth. Stewart and Sotis dove the wreck descending to 230 feet three times that day, using closed system rebreathers. Stewart was an experienced diver with probably thousands of dives in his logbook, but new to rebreathers. The two men surfaced for the final time just after 5 p.m. within sight of the dive boat’s crew members. Stewart gave the OK sign but Sotis appeared shaky as he climbed aboard the boat and blacked out moments later. While he crew treated Sotis with oxygen, believing that Stewart was OK they turned their backs to the water. But when they again looked for Stewart in the water, he was gone. Jeremy Weaver, senior chief of the U.S. Coast Guard, told CBC Toronto said that Stewart “resurfaced at the end of the dive, and as the boat was turning around to pick him up, he went back under — and was not seen again.” A dive team from Key Largo Fire and Rescue finally found Stewart’s body three days later. It was 300 feet from his last known position, on the bottom of the ocean floor. Rebreather potential and hazards I never used a rebreather, but present here some technical facts derived from reliable sources*. A rebreather recirculates the exhaled gas for re-use and does not discharge it immediately to the surroundings. Thus it will produce no bubbles like with an ordinary scuba regulator. In a rebreather the exhaled gases are directed through the chemical scrubber, a canister filled with a carbon dioxide absorbent such as soda lime. This removes the carbon dioxide from the gas mixture and leaves the oxygen and other gases available for re-breathing. Normally a rebreather has two sets of counterlungs: an inhalation side and an exhalationside.The counterlung is a part of the loop which is designed to change in volume by the same amount as the user's tidal volume when breathing. There are two systems on the market. Semi-closed circuit rebreathers only use one gas cylinder with mixed air content (e.g. normal air, enriched air, trimix). It usually pushes gas into the loop with a constant flow. This system will need to let gas out from the system every other minute. Closed circuit rebreathers utilize two gas cylinders: one diluent tank (normal air, enriched air, trimix) and one oxygen tank. This system will add the exact amount of oxygen needed and will be more efficient and quieter than the semi-closed system. In a fully automatic closed-circuit system, an electronically controlled valve injects oxygen into the loop when the control system detects that the partial pressure of oxygen in the loop has fallen below the required level (see Closed circuit rebreathers for more details). Rebreathers might be equipped with bail out valves that offer the diver a fast way to switch to, and breath from an open circuit of the diluent tank. The technical virtues of modern rebreathers are often praised in commercial ads, but experts agree that diving with these systems entails a higher level of risk than with open circuit diving. Reports from DAN, HSE and BSAC indicate much more diving casualties with rebreathers than with convential diving apparatus. Sportdivers using rebreathers are considerably more prone to accidents than military divers who operate in much more strenuous conditions**. A major disadvantage of most rebreathers is that due to a failure gas may continue to be available for breathing, even when the mixture provided may be dangerous but not apparent to the user. For instance, system failure or human error could easily disrupt the oxygen control mechanism leading to a low concentration of oxygen, blacking out and ultimately death. Experts say that it’s easy for beginners to accidentally flood the breathing loop, which can drag a diver down. Mixing the gases is also potentially dangerous: if a diver were to accidentally breath hypoxic gas at the surface, he could also black out and sink. Considering that both divers passed out, they probably encountered the same difficulties, such as lack of oxygen (hypoxia) or carbon dioxide poisoning (hypercapnea). The question is why they attempted three deco dives on the same day? Did they perhaps use the same soda lime canister on their three consecutive dives, resulting in its depletion when surfacing on the last dive? Or were they using the bail out regulator and breathing gas of the diluent tank with a low oxygen content? Hopefully the final reports will shed more light on the cause of this tragic accident. May Rob Stewarts soul rest in peace.